Next opening on May the 1st. Book now! Do you want to travel to Majorca and discover El Arenal? The hotel Blue Sea Mediodía*** and its 178 rooms has everything you need to enjoy a wonderful stay. The hotel has a great location, only 50m away from the beach and its promenade, with a wide range of shops, bars and restaurants to have a nice drink and enjoy the breeze. The hotel was last refurbished in 2007. Welcome to the hotel Blue Sea Mediodía***, the ideal hotel for your Majorcan holidays. 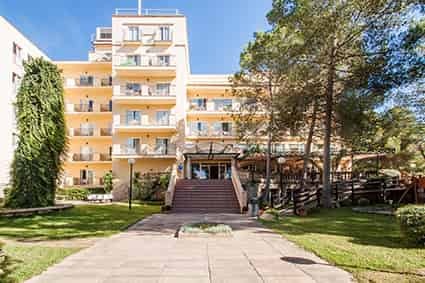 Its position close to the airport in the outskirts of Palma brings the perfect base for those holidaymakers ready to discover the wonders of the island and freely move from one place to another. If that’s not enough for you, El Arenal offers a never-ending beach, with white sands and crystal clear waters for those relaxing, sunbathing days. And last but not least, those who love water sports will love the resort, as there are many activities on offer. The promenade offers a wide range of stores, bars and restaurants, and it’s only 50m away from the hotel. 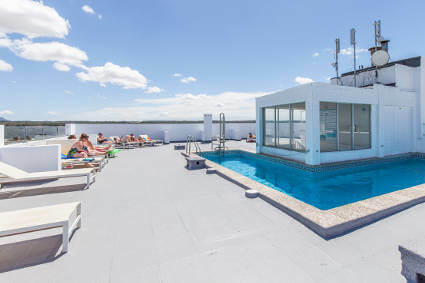 The hotel Blue Sea Mediodía*** and its 178 rooms offer free Wi-Fi across the whole building, open reception 24h. The youngest will enjoy a leisure area in the hall with TV and a public computer. The rooms come with 2 single beds and private bathroom with a hair-dryer included, TV and safe (with additional cost). Those who love cycling will be able to rent bikes at Blue Sea Mediodía***. The island treasures incredible routes for all levels, from beginners to pros, and the hotel settles a great starting point. The beautiful pool will offer you a refreshing, relaxing time throughout your fun-packed holidays. With our half-board option, you will be able to enjoy all you can eat breakfast and dinner in the hotel’s restaurant. Book now your stay at hotel Blue Sea Mediodía***. We are waiting for you. The double rooms offer 2 single beds and a private bathroom with hair-dryer included. These also have aircon, TV, phone, safe (with extra cost) and free Wi-Fi. Solo-travelers will find our single rooms great. They have private bathroom with hair-dryer, TV, aircon, safe (with extra cost) and free Wi-Fi. Have a drink and enjoy some music in our Bar-Lounge. The hotel Blue Sea Mediodía*** is located in El Arenal, Llucmajor only 50m away from the promenade, and the fabulous beach it homes. It’s only 10 minutes away from the airport and 15 minutes away from Palma, accessible by car or by public transport. The closest beach has a blue flag certificate and has crystal clear waters and thin, golden sand. There is a vast range of water sports on offer, or you can lay your towel and sunbathe under the Majorcan sun while having a cocktail. Other fun activities close to the hotel are the Aquarium, Golf Fantasía and the waterpark Aqualand. If nightlife is what brought you here then you have a huge range of pubs, bars and nightclubs to enjoy in El Arenal, or in Palma. There’s no excuse not to have fun in your holidays at hotel Blue Sea Mediodía***, so don’t wait anymore and book now your stay with us.